Sometimes, it’s nice to sit back with your feet up and tune into your favourite radio station so that you can catch up on the latest news, gossip, and tunes. It provides you with a little personal time so that you can make the most of your day (or evening) and really unwind. It makes for the ideal relaxation after a stressful day, and there is only one thing you need. A DAB radio is your best option, as it will give you unlimited access to all the radio stations you could want, and they also tend to be very portable – making them simple to carry between rooms or even homes. However, we also know the importance of a budget, and that not everyone can spend a fortune on a new radio. So, we have dedicated this guide to finding you the ultimate DAB radio for a low price (under £50). You are sure to be more than a little impressed with the line-up we have prepared for you. It’s not always easy to know what to choose or which brands are best, but we are here to give you a hand with things. 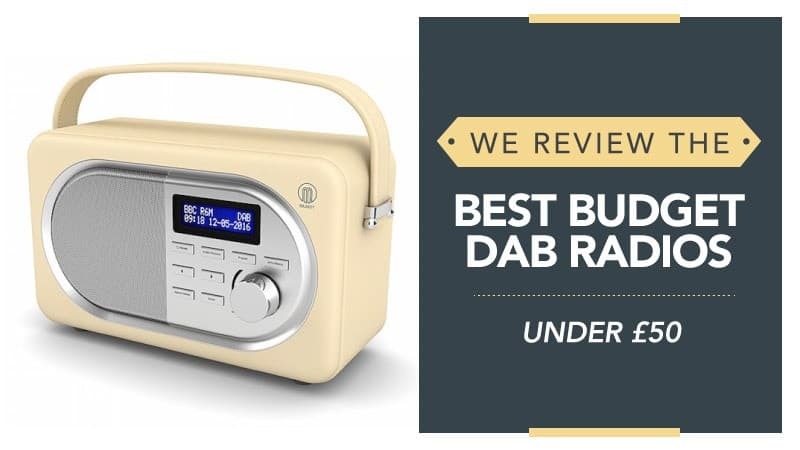 In order to help you find the best DAB radio under £50, we have put this guide together, compiling all of the relevant DAB radio under £50 reviews in one place, so you can find the best one for you. What is a DAB Radio? You might be wondering what exactly a DAB radio is, and the explanation is actually surprisingly simple. It stands for Digital Audio Broadcasting, and works by converting analogue audio into a digital signal, creating a better transmission and a wider reach than the standard FM radio. There are also more stations available, and it is a more energy efficient form of broadcasting. When you look at radios and see that they have both DAB and DAB+, the difference there is quite important. DAB+ was launched in 2007 and uses more advanced technology for the conversion of audio signals. A radio that has access to DAB but not DAB+ will not be able to access as many stations, so bear this in mind when you go to buy. 97% of the UK has access to DAB stations, as do a good number of countries in Europe, so when you are travelling, you should be fine to pick local DAB stations up. However, it should be noted that the USA and Canada do not have DAB at present, and you should always check to see if your country has access before you buy. 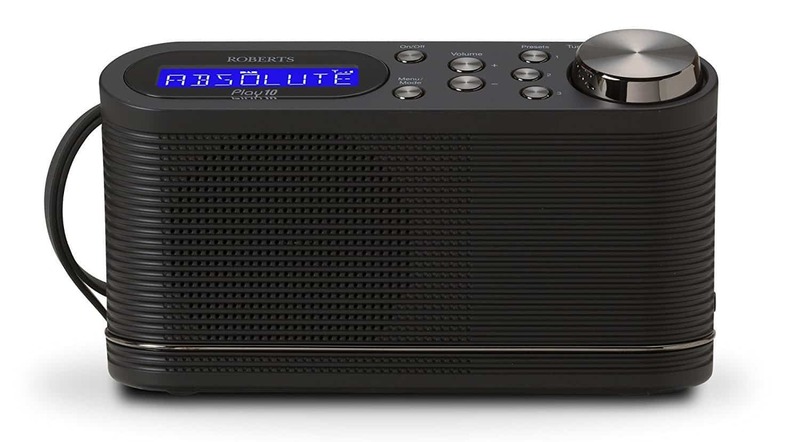 Now that you know a little more about these brilliant radios and how they work, check out the DAB radio under £50 reviews below and see what you think. Sony is a fantastic brand, and one of the best when it comes to audio devices and electronics, so you know you are getting a good deal when you discover one at a budget price. If you think that this could be the portable DAB radio of your dreams, keep reading to learn more about it. This nifty little radio has a slim and modern design, so it won’t take up too much space in your home or backpack. It also comes in several different colours, allowing you to pick the one that best suits you. The LCD display is easy to read, and the soft light also ensures that you can see all of the information at night. You can also power it with batteries or use the supplied AC adaptor. It can access both DAB and DAB+ stations, as well as the usual FM wavelengths, and has five presets that go directly to the stations that you love the most, so you never have to miss another show. The wake-up and sleep timer means that you can set the radio to work around your day, and there is even a headphone jack included so that you can spend time listening to stations in private. You have to have it plugged into the mains in order to use the alarm clock feature. This nifty little DAB radio comes at a great budget price, so you don’t need to spend a fortune on a great quality piece of tech. While it is a shame that the alarm clock feature does not work when you are travelling or camping (without mains access), it still makes for a superb radio that has excellent sound quality as well as access to all of your favourite stations. Overall, it certainly does make for one of the best portable DAB radios that we have seen. 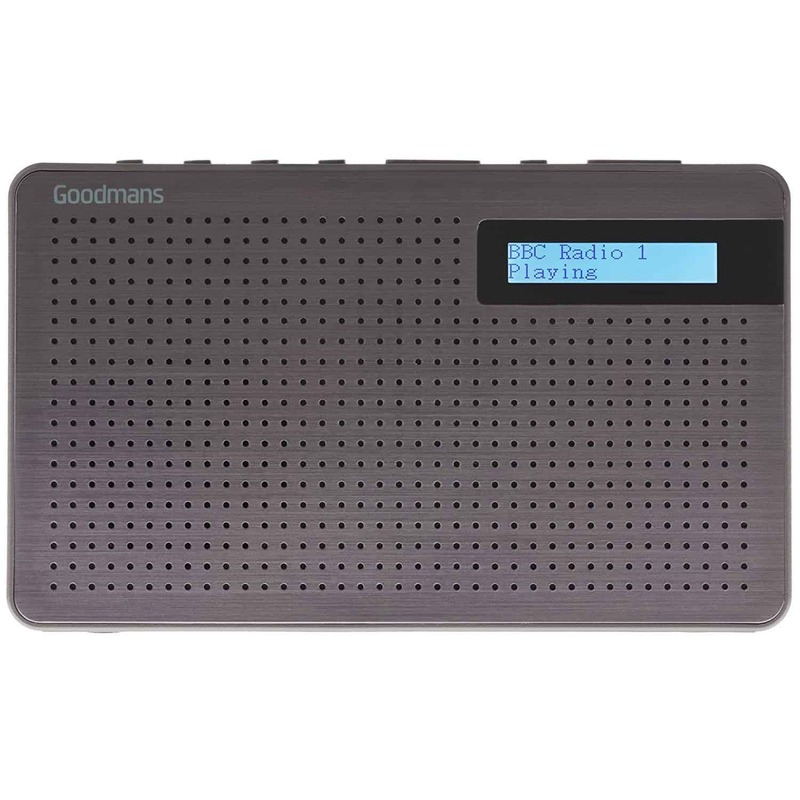 Goodman’s is also a fantastic name to choose, and one that has gained the trust of thousands across the globe. If you are in need of something with great portability, that is low in terms of price, and still offers the quality that you would expect from a big name, then this could be the one for you. 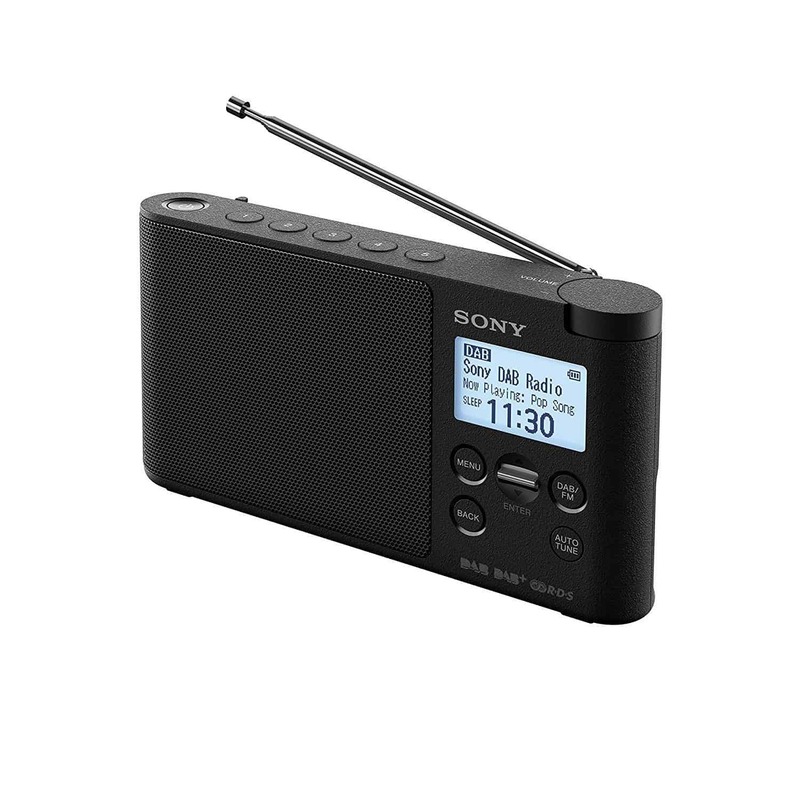 This little radio is actually pocket-sized, and comes in black with a slim and modern design that you are sure to love. You also have the choice to buy it with or without headphones, which is great for those who don’t own a pair and would like some from a good brand. You also have access to DAB, DAB+, and FM radio stations, so that you can always access the shows you love the most. The sound quality is great (both with and without headphones), and you can control everything very easily with the simple buttons on the front of the device. The screen is easy to read, and all the information is clear for you to see. The battery life can last for 13 hours (or 6 hours if you are not using headphones), so you have more than enough time to listen to the radio while you commute. The presets can be a little difficult to set when you first operate it as the instructions are a bit vague. This portable DAB radio comes at a low price that you are sure to be pleased with, and that can fit into any budget. It is a fantastic option to go for, and while the presets can be a little difficult in the beginning, you will get the hang of it in no time at all – leaving you in full control. With access to all of your favourite stations, as well as the option to listen with headphone or without, it really does have everything you need to enjoy the radio in your own time. 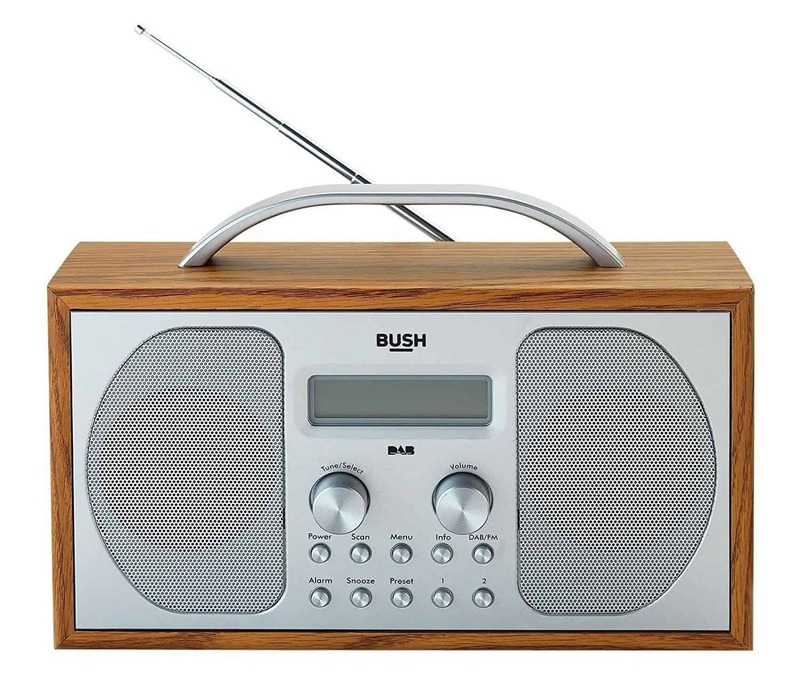 Bush are the manufactuers of quality electronics, and you are sure to be left feeling amazed when it comes to this little radio. Portable and with a classic design, ther is a reason it has made it to our top picks. Before you scroll past, take a moment to read a little more and see what you think of it. This portable little radio has a very classic, almost retro, design and comes in white with a gorgeous wooden casing for a little more durability. It can be placed anywhere in your home due to its aesthetically pleasing style. It is mains operated, and comes with the ability to set an alarm that will wake you up in the mornings with your favourite radio station. There is also an auto time update. It gives you full access to DAB, DAB+, and FM stations, so that you don’t miss a thing, and the controls are all located on the front of the radio with clearly written names. There is a small LCD screen that displays all of the key information, and the auto scan feature will help you to find your favourite stations. Plus, there is a comfortable handle on the top for easy transportation. There are only two presets and the backlight is not as bright as it could be at night. This wonderful portable radio comes at an affordable and budget price that most will be able to afford, and has a stylish design that leaves it looking more expensive. One the down side, there are only two presets and the backlight is not as srong as it could be, but these are only small niggles when compared to the massive benefits this machine offers. From a wide range of stations and an alarm clock, to some extra features you are sure to love, it really does have everything you need and a bit more. Here are some further models of DAB radio, just in case the ones above do not quite meet your requirements. Roberts is a fantastic and reliable brand, and this DAB radio comes at a fantastic and budget price, making it the perfect option for those who are looking to save a few pennies. All of the controls are located on the top for clear and easy access, with a LCD screen that has a good display for viewing during the day and at night. You can listen to DAB, DAB+, and FM stations, ensuring that all of your favourites are in accessible, and there are multiple presets to make things even easier for you. Plus, the sound quality is fantastic so you won’t be disappointed. 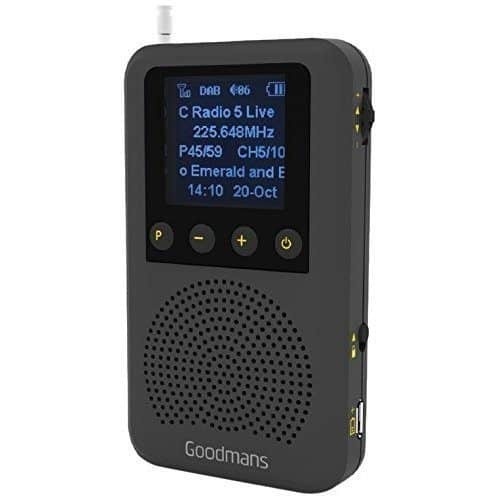 Another great model from Goodman’s, this radio might be cheap and cheerful, but it certainly has a modern appearance and a slim build that makes it perfectly portable when you are travelling between places (or even rooms). It comes with a telescopic antenna so that you get better reach when flicking through stations, and it is also quite sturdy so that it does not break easily. You get access to DAB and FM wavelengths, and there is also a headphone socket so that you can experience private listening at any time. With great sound quality, you might find that this model is everything you need. Hopefully, this guide has helped you to find the best DAB radio under £50, and that they have given you a good idea when it comes to determining what is going to work best for you when it comes to portable DAB radios. The whole point of this particular guide was to bring you the best deals and budget radios from leading brands – so you are guaranteed quality at a low price. Each of the DAB radios here is not only portable for your convenience, but also comes at a great price that anyone can afford. Plus, with brands like Sony and Goodman’s filling the listings, you know that you are in for a musical treat. We know that the perfect model is here and waiting for you, and we personally recommend Sony’s radio dub to its excellent sound quality and stylish design. What did you think of our DAB radio guide? Are there any that you would have liked to see or recommended? We love hearing from you, so make sure to leave us a message in the comments below.